Wild dogs spend their days foraging, exploring, digging, and playing, as well as resting. Domestic dogs often spend their days in the same environment day after day with little challenge or stimulation. Many dogs are left alone for eight or more hours a day while their humans go out to work. In that situation, a dog is likely to crave stimulation. By providing them with activities that encourage their natural behaviors, you can enhance their well-being as well as making them more enjoyable to live with. Feeding for enrichment is a relatively easy way to add some interest to your dog’s day. There are loads of enrichment toys on the market for dogs. Slow feeders, food dispensing toys, automated food dispensers, toys designed for stuffing with dog food, and puzzles to load with food are all ways of feeding that don’t involve a food bowl. (See my blog post on stuffing bones to learn how to feed your dog his food from bones.) Rather than giving your dog her food in a bowl, try putting her food into bones or toys or hiding it around the house. The same food that would be inhaled in 45 seconds can keep your dog entertained for 45 minutes, and help satisfy his need to forage. Lately I’ve been making snuffle mats out of fleece. I first saw a snuffle mat being used at a conference where dogs needed to lie quietly for a few hours at a time. The dogs I saw using them were completely entertained with minimal effort from their handlers. The mat is like a small square of very shaggy carpet that you drop bits of food into. The dog needs to search around for the bits of food. Snuffle mats need to be used with supervision, to ensure your dog doesn’t chew the mat itself, rather than the food, but can be a great way to keep your dog entertained while you are on the computer, reading or watching TV. 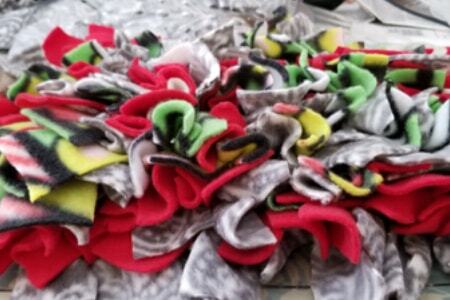 The image above is a snuffle mat that I made for my dogs. In our last installment in this series on Boredom, we’ll talk about Activities you can do with your dog. Have you used feeding methods for enrichment and entertainment? Tell us about your experiences, and the impact it’s had on your dog!